Favorite thing about Fleet Feet Sports: The helpful and and friendly employees and the sense of community! Fun fact: I honestly thought I had a better chance of going to the moon than running a marathon.It wasn't even a dream to do a marathon because it was so out of the real of possibilities. Well, I was wrong. How did you get into fitness? At age 25, I was a professional actress and hated the gym. I started running to lose weight and stay in shape. The first time I ran a mile, I was elated. I fell in LOVE. Then, after the birth of each of my three boys - running with my bob stroller helped me get back in shape. I've now started triathlons as a way to cross-train. Favorite thing about Fleet Feet Sports: Knowledge of staff! They not only know what they're talking about, they LOVE it! Favorite post-race meal: Steak and martinis! Fun fact: My family "modeled" for the City of Annapolis Visitors Bureau campaign on SUPs at Weems Creek! We got a pro photo shoot and it will be used throughout next years' marketing campaign! How did you get into fitness? Well - running shoes are cheaper than therapy! I started running December 2013 with the Winter Warriors program to blow off some steam. I've met a great new group of people and I've made new friends who push me to be a better runner and are so supportive! Favorite thing about Fleet Feet Sports: Everyone is so friendly and welcoming and supportive of newbie runners! Fun fact: I sailed under the bay bride before driving over it. How did you get into fitness? About 9 months ago, I was introduced to Fleet Feet Sports' No Boundaries: Couch to 5K Program. I met SO many great people who (like me) had never run before. Everyone was so supportive and encouraging. What was once a torturous activity had become FUN! I enjoyed meeting with my new friends three times a week and actually looked forward to it! Favorite thing about Fleet Feet Sports: The people! Everyone is so supportive and helpful! Fun fact: Before I joined No Boundaries, the last mile I ran was in 1998. I was voted class laziest and now I can't sit still for a second. I can run a 5K without stopping pushing a baby stroller! How did you get into fitness? I wrestled for 12 years in primary/high school. After high school I moved to Fort Collins, Colorado and ended up on the Colorado State Triathlon Team. Post college, I spent a lot of time riding and racing around the state before I tried out for the Fort Collins Cycling Team. Ultimately I got a job offer in Annapolis and joined the Fleet Feet Tues/Thursday Fun Runs where I trained for my first Marathon.. 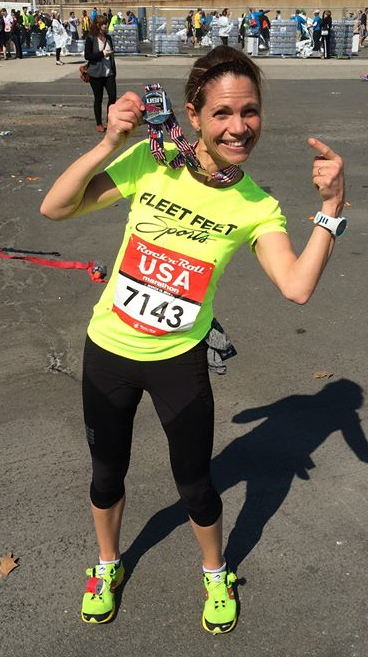 Favorite thing about Fleet Feet Sports: I met my girlfriend - and a lot of great friends through Fleet Feet! Fun fact: I have two spirit animals. A polar bear and my black lab, Cassidy. How did you get into fitness? About 10 years ago, I set my goal to run the Quite Waters loop without stopping. That led to my first 5k, 10K, 10-miler, 1/2 marathon and marathon in 2009. Favorite thing about Fleet Feet Sports: Friendly and knowledgable staff - and great products! Fun fact: I'm one of four kids and I'm the only one that did not do track and field! Now as an adult - I'm the only one running! How did you get into fitness? I took up running in middle school and it's been a part of my life ever since. Now, in addition to running for beer, I'm targeting to get an 18 minute 5K. Favorite thing about Fleet Feet Sports: The location and the people that work there. Fun fact: I've actually ran underwater. To hear more - you'll have to come ask me. How did you get into fitness? I was an avid soccer and basketball player for most of my adolescence. I was first introduced to running in high school where I ran cross country, indoor and outdoor track. I then ran cross country and track at Juniata College. Post college, I began to participate in the fleet feet fun runs and decided to become more involved as time went on! Favorite thing about Fleet Feet Sports: Welcoming running community and fun, relaxing atmosphere! I have made amazing friends and met my boyfriend through the group! Fun fact: I love hiking and exploring national parks! I've been to half in the US! How did you get into fitness? In November 2011, I signed up for my first Fleet Feet Sports No Boundaries Couch to 5K program because I didn't want to enter the holidays being a slug and eating a ton. I continue running and training with Fleet Feet since then, and now I'm a mentor for the 10K program. How did you get into fitness? I started running cross country in high school, then just ran in college and got more serious about racing since I graduated. Favorite thing about Fleet Feet Sports: The very knowledgable staff - and the committed group of the weekly group run is awesome! Fun fact: My life running goal is to race as many different distances as possible. So far: 1 mile, 5K, 10K, 15K, 10 mile, Half, and Ragnar. Next stop: marathon! How did you get into fitness? My wife signed up for the couch to 5K program, and I thought it was a good idea - so I did too. I then followed with the 10K training program - and now I'm a mentor for the No Boundaries program. Favorite thing about Fleet Feet Sports: The training programs Fleet Feet does - and of course, the staff! Fun fact: Some day, Bart (our lab) will run with us. How did you get into fitness? I was significantly overweight and really enjoyed being active after I lost close to 200 pounds. I stopped into Fleet Feet to get shoes, and Laura invited me to participate in the Couch to 5K program they had going on. Since then my husband and I have been running and really enjoy it! Favorite thing about Fleet Feet Sports: The knowledge of the staff and the welcoming atmosphere. Fun fact: My cousin Rosemary Harris was "Aunt Mae" in Spiderman; My grandmother lived to be 105; I was the National Program Leader for Nutrition for the US. How did you get into fitness? I was a field hockey player at Lynchburg college for four years. Three years after graduation I decided to get back in shape. I joined the summer 2012 No Boundaries: Couch to 5K program, went on to the fall 2012 half marathon program, and mentored the spring 2013 No Boundaries program. I then went on to complete my first FULL marathon in October of 2013! Currently, I'm back coaching at Fleet Feet! Favorite thing about Fleet Feet Sports: Everyone knows me! It's a nice feeling to be greeted by your name. And the training programs are AMAZING! Fun fact: I complete my first marathon less than a year later of doing my first 5K with the No Boundaries: Couch to 5K program!